DapperLads began in 1998 with an early web presence devoted to adding a more youthful handsomeness and style to boys special occasion and holiday clothes. As the first, or close to it, on the web with a childrens clothing store devoted just to boys clothes, DapperLads quickly found its niche. A fondness for the olden day styles of boys clothing turned into the cornerstone of DapperLads looks. Affordability was key from the start in connecting with young moms fast growing boys and ofttimes limited budgets. "Why spend a lot if they might only be wearing the suit once?" owner, Becky Rosen, philosophized. Variety was also key as a way to combat blandness in the boys clothing market. Lots of color choices and a full array of accessories for boys provided the backdrop for adding spirit, creativity and self-expression into the look of each dapper lad. Along the way, DandyLasses girls clothing was added for brother-sister matching looks. 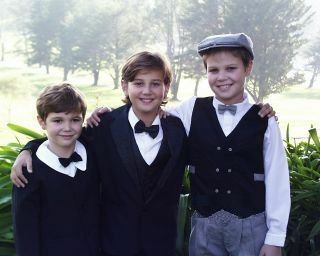 Pictured above are the original DapperLads models, sons Grant, Mitchell and Jacob.